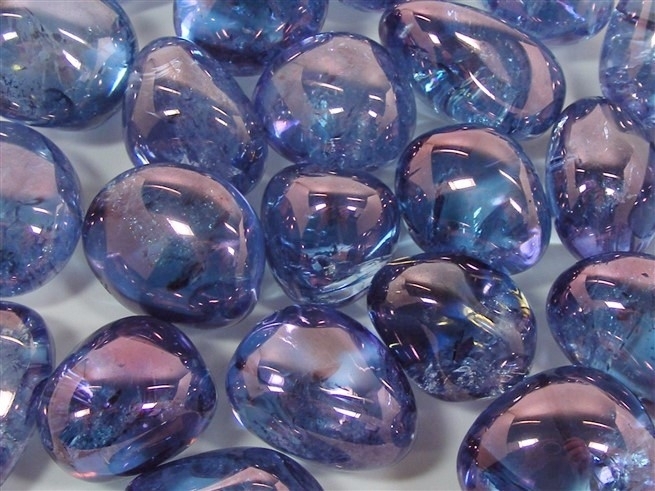 Lovely, lovely tumblestones of Tanzine Aura Quartz with their wonderful soft, mystical, purple/blue colouring. 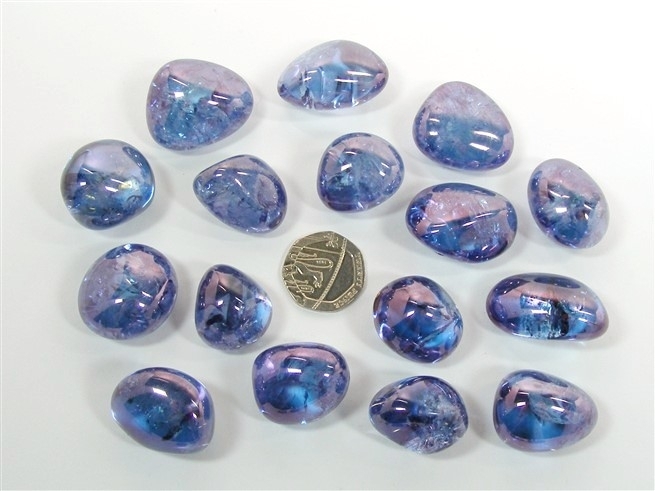 These stones are bigger than our normal Tanzine Aura Quartz and the colour is more intense. These are Quartz tumblestones that have been treated with both Gold and a rare metal called Indium with a process that permanently bond the precious metals to the Quartz. It will not rub off or wash off. These are all really top, top quality, nice sized, pieces with a good amount of "aura" on them. This is a great stone to work with and it has a great feel to it ! Tanzine Aura Quartz is clear Quartz that has been treated with Gold and a rare mineral called Indium to create its wonderful violet sheen. Tanzine Aura is believed to be beneficial in regulating an under active thyroid and both the pituitary and pineal glands. It is also thought to balance our metabolism and our hormones and assist with our body's assimilation of minerals. Some believe that it may also help to treat migraines. Tanzine Aura helps to clarify our thoughts, make us more intuitive and perceptive and is also said to stimulate inspiration. It is an excellent crystal for those who are convalescing after illness or surgery. Tanzine Aura carries the violet ray and stimulates our third eye and crown chakra to help us better connect with the higher spiritual realms. It provides us with a deep spiritual comfort and helps us to develop our psychic abilities and our communication with the spirit world, making it an excellent crystal for readers, mediums, healers and shamans. It also helps us to contact other-worldly beings. Tanzine Aura also helps us to communicate to others, visions that we may have seen or experienced during our contact with the spiritual realms. Working with Tanzine Aura may provide us with information on the mysteries of the universe and access to the Akashic records. It is a crystal that can raise our vibrations and one that can help to protect us against negative energies.